Audi continues to set trends with the introduction of the all-new A8, this time boasting the title of "first production car equipped with Google Earth." Check out the full details below. Ingolstadt, 16. December 2009 – In early 2010 Audi will be bringing the next generation of the A8 to the starting line. The new flagship and its online services further demonstrate the brand's proverbial Vorsprung durch Technik, by bringing a variety of Google services and information to the luxury sedan via the internet. The services will be available in selected markets. The new A8 has set the bar at new heights with regard to multimedia technology. 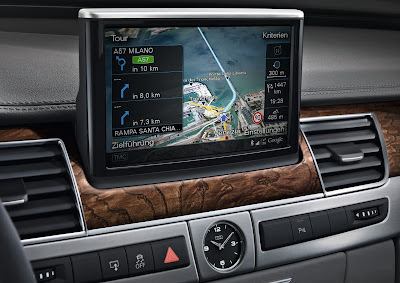 Its multimedia interface (MMI) navigation plus features among other innovations, a highly evolved operating concept incorporating a touchpad – known as MMI touch. Also included are an integrated hard disk for navigation, phone and audio data and a graphics processor capable of generating high-quality, three dimensional images. The MMI analyzes navigation data predictively, relaying information to the control units managing the automatic cruise control with Stop & Go, adaptive lights and the 8-speed tiptronic gearbox so that these systems can precisely adapt their function to conditions well in advance. Equally state-of-the-art are the Audi online services which allow the new A8 to retrieve up-to-date information from the internet via the optionally integrated GPRS/EDGE modem in the MMI navigation plus. The user can search online with Google for points-of-interest directly from within the MMI, the versatile search engine accepting such free text search queries as "delicatessen" or "shoe boutique". The results are then displayed on the onboard map or used as destinations for route calculation. The data connection enables a further comfortable feature. A8 customers can plan their navigation destinations in Google Maps or the Audi web portal at home or in the office and retrieve these on demand in the car. 8 inch LCD display the new Audi A8 allows its occupants to discover the world from above. The Google Earth imagery and 3D terrain model are combined with the detailed street network from the onboard navigation database as well as calculated routes in a seamless integration of online and offline content. To use the new online services the customer simply needs to insert their SIM card in the MMI Navigation plus or pair their mobile phone with the MMI over the Bluetooth SIM-Access-Profile. Aside from the Customer's existing mobile phone data plan, no additional contracts are required. First shown as a prototype with Google in January 2006 at the Consumer Electronics Show in Las Vegas/USA, the new online services can be experienced in the new A8 as a result of a close collaboration between Audi and Google development teams worldwide.